Atop Johnson Mesa in New Mexico by Kathy Weiser-Alexander. Located 16 miles east of Raton on New Mexico Highway 72, was the town of Bell, New Mexico, a farming community on top of Johnson Mesa. 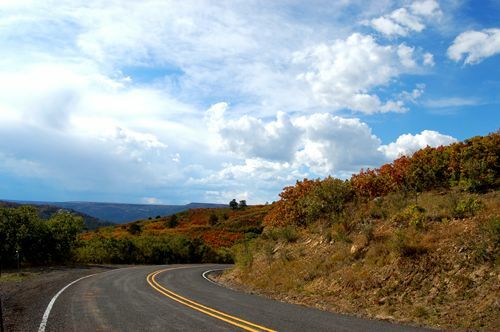 The highway, part of the Dry Cimarron Scenic Byway, twists and turns as it climbs through the coal-bearing canyons east of Yankee, often providing visitors with glimpses of deer, turkey, and bear, as well as gorgeous views to the lower elevations. Suddenly the road takes a turn and travelers find themselves on an enormous plain of almost 100 square miles. 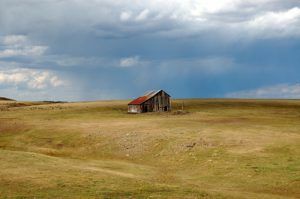 Johnson Mesa is about 14 miles long, running east to west, and 2-6 miles wide north to south, and the high, grassy plateau sits 2,000 feet above the valley floor. The first white settler in the area was Elijah “Lige” Johnson, who established a ranch in Johnson Park in about 1882 and pastured cattle on the mesa. Johnson Park, the earliest access to the plateau, is located below the south rim of Johnson Mesa. Both the park and the mesa take their names from Elijah Johnson. Around 1887, Marion Bell, a railroad construction worker, led a group of fellow workers and miners to the mesa top, trying to find a safer and more predictable occupation. Several families filed for homesteads and began to farm. The people of Johnson Mesa, raised potatoes, oats, grain, vegetables and hay and eventually branched out into cattle ranching. Some of the miners, who had come from the mining camp of Blossburg, near Raton, tried to juggle both occupations. The Blossburg Mine was somewhat sporadic and at times, labor difficulties temporarily closed the mine. For those ambitious fellows working at both farming and mining, carrier pigeons were dispatched from Blossburg to fly up to the mesa to notify the miners that they were needed down in the Raton Valley. Johnson Mesa Church, New Mexico by Kathy Weiser-Alexander. 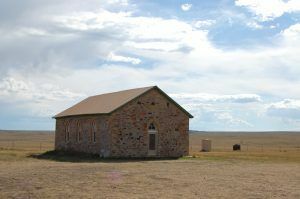 The settlement that grew on the mesa was called Bell for Marion Bell, and a post office was established in 1891 that operated out a small general store. More people came to the area and at one time, there was a family living on every 160 acres of land. The St. John’s Methodist Episcopal church was built in 1899. At one point, five schools were scattered around the mesa. The area residents held an annual celebration on August 14, the date the church was dedicated. July 4th was celebrated with horse races, foot races, and a rodeo. During the summer months, dances were held every week at a dance pavilion that was built on top of a large hay barn. Bell’s population peaked in about 1900 with 487 residents. But times were often hard on the mesa as winters were severe, often rendering the residents snowbound for weeks. During the rest of the year, the grass was in abundance, but the water was not. The long, cold winters defeated many farmers and by 1910 the population had dropped to 335. The 1918 flu epidemic and difficult farming conditions reduced the community to only about 215 by 1920. People continued to leave and Bell closed its post office in 1933. Cemetery Atop Johnson Mesa, Kathy Weiser-Alexander. Today, all that is left of the old town of Bell are a few deserted farm buildings, the St. John Methodist Episcopal Church, and the cemetery. The grassland pastures continue to be used seasonally for cattle grazing. 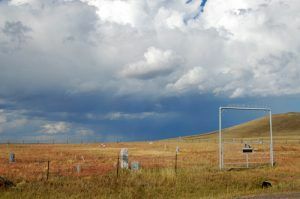 Visitors can continue the drive along the Dry Cimarron Scenic Byway, by heading eastward on Highway 72 to Folsom, which is 19 miles past the old settlement of Bell. The descent from the Mesa provides is spectacular views. © Kathy Weiser-Alexander, August 2018. Coming down Johnson Mesa. There’s a reason why this is a scenic drive, by Kathy Weiser-Alexander. This is a great condensed history of Johnson Mesa. I have spent many an evening up on the mesa with my cameras. I think it is one of the prettiest places I have traveled to. So very peaceful. Thanks again.